Inspiring sustainable growth of a healthy urban community through trees, green spaces, food, education, training and job opportunities. 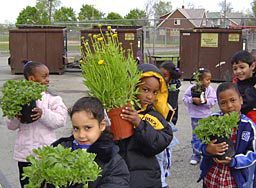 The Greening of Detroit is a well-established, nonprofit resource agency that partners with federal, state and local agencies, corporations and foundations to assist neighborhood groups, churches and schools in their efforts to improve the ecosystem in Detroit through tree planting projects, environmental education, urban agriculture, open space reclamation, vacant land management, and workforce development programs. Transforming this city from a post-industrial urban center into a healthier, safer and greener environment will take commitment and a bold new way of thinking. We are ready for that challenge.